Each week I turn to Lynne Rossetto Kasper's voice for comfort, guidance and compassion. Sure, the topic of her podcast, The Splendid Table, is food, but her warmth, curiosity and knowledge emanate deeper than just sustenance. And her voice is captured clearly in The Splendid Table: How to Eat Weekends, her second book with Sally Swift. In their first book, How to Eat Supper, they focused on weeknight cooking. In this volume, their goal was to focus on recipes that take a bit more time, a bit more thought. The authors hoped the resulting dishes would be both special and pleasurable. I was optimistic about this book for a few reasons. I knew that Rossetto Kasper understood food. I also knew how much she appreciates spices and full flavors from a range of ethnicities. From How To Eat Supper it was clear that Rossetto Kasper and Swift were capable of writing a book that transcended the label of "cookbook." In How to Eat Weekends, there are glorious recipes and photos. But within the pages are also other treats. Kasper and Swift included quotes to inspire and a fabulous section called "Building the Library" in which they recommend their favorite books for regional cooking. They go further with collages of food from Italy, India, Mexico, Vietnam, Italy and China. Throughout the book are tips on everything from choosing a dining chair to a knife and matching wines. In "Cook to Cook" they offer up gems of kitchen wisdom to enlighten even the most knowledgeable chef. As a working mom I also appreciated their "Work Night Encores" in which they transform leftovers into a quick weeknight meal. They include clear directions about how to prepare elements of a dish in advance and how to store it for future meals. I love the authoritarian (but never condescending) voice that insists that "fresh cut corn is key; frozen or canned simply will not make the cut." And though some recipes are complex and have multiple elements, each element is wonderful on its own. For example, I used the candied lemon from the Unusual Italian Salad for the meatballs, salads, sorbet, a lemon cake. And the truth is that none of the elements were too complicated. Finally, though, it is the headnotes to each recipe that are such pleasures to read. Each one is a story that made me want to race out the grocery store and begin to cook. And I did. And here is my one confession: as I am single, some of the most exciting recipes, such as "Moussaka of Lamb and Red Wine Ragu" or the "Yucatan Pork in Banana Leaves" are more than I can eat, but it simply meant that I convinced a few friends to come over. There were also many other dishes, such as the soups and salads, the pastas and chicken dishes, the vegetables and sides that were incredibly easy to down-size for my life. Pintos and Red Wine Soup with 20 Cloves of Garlic-This was a solid bean soup. It reheated beautifully and was best topped with thin slices of spicy salami, shards of Asiago and drizzles of olive oil. Orange Onion Salad with Warmed Coriander Oil--The are two genius skills in this dish. First, the simple act of icing the red onions, takes the bite out and brings out the sweetness. Likewise, warming dried coriander in olive oil accentuates its wonderful citrus qualities. I ate this many times in one week. North African Bread Salad-This salad hit the right notes with the mix of paprika, allspice, fennel and preserved lemon. It was even better on day two as the stale bread lapped up the dressing. Grilled Lettuces with Pine Nut-Parmigiano Cream-While the dressing was a bit heavy for my taste, I loved the smoky taste of the grilled lettuce. Pineapple, Greens and Tofu with Roasted Chile-Coconut Dressing-As Rossetto Kasper and Swift write, this dish is wonderful on its own, but the dressing is just heavenly. I used it on seared tofu, rice and noodles later that week. An Unusual Italian Salad (with Candied Lemon Peel and Balsamic Syrup)-I confess that I loved the balsamic syrup so much that I ate it by the spoonful...and on ice cream...and on oranges. I used the candied lemon peel in a lemon-yogurt cake and stirred into Aperol and vodka. Together, though, the salad is wonderful. Barley Risotto with Saffron, Corn and Chives-This was a great side dish as it was easy, light and yet filling at the same time. I may skip the saffron next time as no matter how lightly I treat the spice, it still dominates. Vietnamese Green Mango Noodle Salad with Grilled Pork-I made this dish vegetarian by braising tofu in the pork sauce. It was still fantastic and bursting with flavor. Renassaisance Lasagna: This recipe was irresistible filled with cinnamon, pancetta, cheese and pasta. I wanted to make it from the moment the authors wondered if it was "too quiet." The most complicated part was buying the ingredients (all available at Whole Foods). It was a meditative meal to make and so different from the heavy, cheese filled lasagnas of childhood (or mine at least!). The authors note it is best right after you make it. But the next day the flavors had combined even more, with the cinnamon lusting up from the meat. I plan to make the ragu again and serve it draped over homemade noodles. Sweet-Sour Chicken Meatballs with Candied Lemon Peel-I loved the idea of this more than the reality. The spinach-almond-lemon-chicken meatballs were fine, but the flavor was too subtle for me to appreciate them. Malaysian Spiced Pork: Oh, I wanted to love this. Mixing star anise, galangal, dark soy sauce and cloves just sounded like a spicy, sweet heaven. But, ironically, mine came out too one-dimensional. I tried to jazz it up with some fish sauce, a bit more palm vinegar and even some chilis, but it remained underwhelming. French Radish Saute-This will transform people that insist they don't like radishes or think they are too sharp. The gentle flavors worked beautifully on their own and next to chicken. Farmhouse Roasted Potatoes-One of the blessings of this dish is the smell that transforms the kitchen. Fennel, garlic, oregano and pancetta creating a nutty, piney oder that perfumed my kitchen. These potatoes were wonderful the next day with scrambled eggs. Braised Belgian Endive-A perfect example of how the simplest of vegetables, when cooked properly can sing. With a slow braise the bitterness of the endive melted away leaving a buttery, sweet, tender vegetable that was as good cool as it was warm out of the oven. Stirred Old Fashioned Lemon Ice Cream-This is revolutionary. Really. Ice cream made with absolutely no ice cream maker. It it took about 5 minutes to prepare. Think frozen custard...with no eggs. I plan to try the recipe with other fruits. Triple (Double) Chocolate Brownie Cake-With allspice and cinnamon this rich chocolate-espresso cake tasted of gingerbread. A day later the warm spices had faded to the background providing a subtle hint that it was more than just chocolate cake. Chili Spiked Mexican Wedding Cookies: I liked these. They were tender and melted in my mouth. But I needed something more-a bit more salt? A bit more sugar? A bit more spice. Other friends insisted that they were just right. 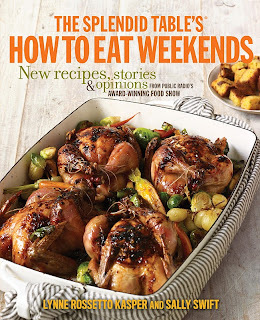 The Splendid Table's How To Eat Weekend's is available September 20th. You can buy it directly from the Splendid Table website here.